A video showing an officer punching a woman on the back of the head at a Jersey Shore beach has gone viral. But a Wildwood official says the clip doesn’t show the whole story. Police are investigating viral video of an officer punching a woman on the beach in Wildwood over Memorial Day Weekend. 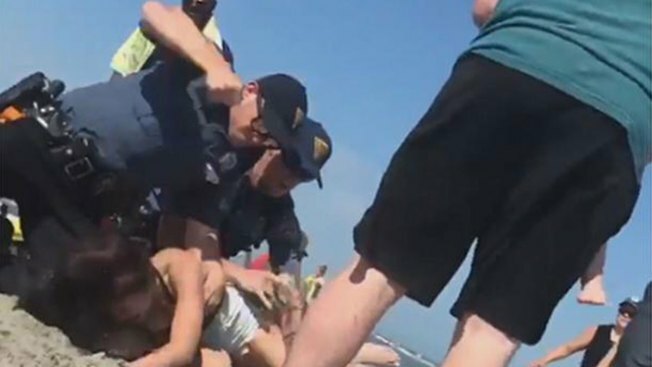 Police are investigating a viral video of an officer punching a woman while arresting her at the beach in Wildwood, New Jersey. Emily Weinman, 20, of Philadelphia, was arrested Saturday and charged with aggravated assault on a police officer, aggravated assault by spitting bodily fluids at/on a police officer, disorderly conduct, resisting arrest, obstruction and minor in possession of alcohol. Wildwood Commissioner of Public Safety Tony Leonetti told NBC10 Weinman assaulted one of the officers first by kicking him in the groin and then running away, which the video does not show. Wildwood Police also say at one point Weinman spat at one of the officers. In a Facebook post, which by Monday morning was apparently taken down, Weinman stated she and her friend were first confronted by two officers. While she admitted to being in possession of alcohol while underage, Weinman claims she wasn’t drinking at the time and that the alcohol was closed. She also said she took a breathalyzer test which came back negative. After the test, Weinman says the officers still stayed with her and one officer followed her as she walked away to make a phone call. Weinman said she didn’t give the officer her name because she “didn’t do anything wrong.” Weinman claims the officer then announced he was going to arrest her and walked toward her to place her in handcuffs. Weinman wrote that she was "partly wrong in a way" for not giving the officer her name but that she didn’t want to do it because she was scared. Weinman has faced charges prior to Saturday's incident, including simple assault and criminal mischief, according to court records. Since being posted on social media, the video has sparked debate, with some supporting the officers’ actions, others insisting that people wait for the entire story to emerge before passing judgment and others condemning what they believe to be excessive force from the officers. Wildwood Police say an internal affairs investigation was immediately initiated on the incident and the officers involved were reassigned to administrative duty pending the outcome. “Chief Regalbuto stated that while he finds this video to be alarming, he does not want to rush to any judgment until having the final results of the investigation,” a Wildwood Police spokesman wrote. Leonetti also told NBC10 they’re waiting to see the body camera footage of the officer involved. The Cape May County Prosecutor's Office would not comment on the incident outside of saying it's under review and that the body camera footage will only be released once Wildwood police complete an internal affairs investigation. Wildwood Mayor Ernie Troiano, Jr. told NBC10 the incident was not a reflection of the Jersey Shore town. "It's really a shame that one minuscule incident happened that ruined it for the whole entire weekend which has been a great weekend," he said. Police are asking anyone who witnessed the incident and has more video to contact Detective Lieutenant Kenneth Gallagher at 609-522-0222.